Bear shame and glory with an equal peace and an ever tranquil heart. I do NOT do this. at. all. If there is equality in shame and glory in my life, it is in the level of intense drama that surrounds my exaggerated emotions. 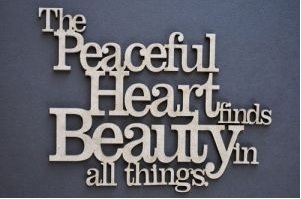 But a peaceful and tranquil heart is something I've yet to maintain for an extended period of time. I adore the peace that comes after the panic or pain has been subdued and all is well when I had previously feared otherwise. But that peace isn't ever tranquil. It's temporary, momentary until distraction sets in and normalcy is again king, complete with a dissatisfied appetite for change. A peace and tranquil heart in shame and glory is something I need. Let's be honest - it's something I can't even begin to understand in deed. But I've decided to start thinking about it and approaching ALL things with the same tranquil attitude. What do you do to maintain peace in your heart?